Gibson had his 6 month checkup yesterday with Dr. Saken and once again he got his regular vaccinations and we were told that he is a perfectly proportioned, but large boy who is in perfect health. He is in the 90% for height and weight! Also, he's getting a tooth! Right smack in the middle on the bottom. I was trying to come up with a witty way to include the song "All I want for Christmas is my two front teeth", but I haven't had enough coffee yet. 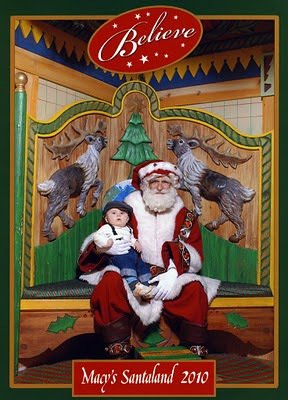 I just wanted to post a quick entry to update his stats (see entry below) and hopefully get his photo with Santa up for his friends and family that might not follow my flickr stream. And to all of his grandparents out there, we're going to send you a copy. We'd have gotten it to you before the holidays if we'd been able to see Santa earlier, but we didn't have the chance till this past Wednesday. We bundled him up and took him into Macy's at Herald Square and he got to see the man himself. I have to admit that Macy's Santa was a bit bored by the entire thing, he had the look as if he was ready for his 3 days till Christmas to be over. But I'm thrilled that we were able to get the photo.